Drama/Comedy/Romance, Italy/France, 1988, 155 min. Tagline A celebration of youth, friendship, and the everlasting magic of the movies. Synopsis DIRECTOR'S CUT VERSIONBeginning at the end, the movie opens with Salvatore's mother trying to inform him of the death of Alfredo. Salvatore, a filmmaker who has not been home since his youth, leaves Rome immediately to attend the funeral. Through flashbacks we watch Salvatore in his youth, in a post WWII town in Southern Italy. As a young boy he is called Toto and he has a strong affinity for the cinema. Toto often sneaks into the movie theater when he shouldn't and harasses the projectionist, Alfredo, in attempts to get splices of film that are cut out by the church because they contain scenes of kissing. Toto has a younger sister and war widowed mother who often struggle due to the loss of Toto's father. Toto is banned from the movie theater by his mother when his film bits accidentally catch fire and nearly kill his sister along with burning up the only picture Toto has of his father along with other family photographs. Eventually he sneaks his way back and forms a father-son bond with Alfredo, despite Alfredo's reluctancy, Toto even learns how to run the projector. Meanwhile one of the townspeople wins the lotto and becomes a rich man. One day in the cinema, after Toto leaves to watch the movie with his friends below, the film catches fire in the projector and knocks Alfredo out. 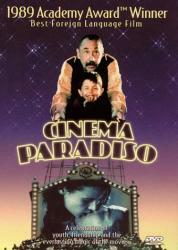 Young Toto rescues Alfredo from death in the fire, unfortunately the cinema burns down and Alfredo loses his sight. Lucky the lotto-lucky-townsman pays to have a new cinema put up. Since Toto already knows how to run the projector he works with Alfredo in the projection room. Some years pass and Salvatore is now a young man. A rich girl, Elena, comes to town and Salvatore and his friends vie for her attention. Salvatore films her and begins to fall in love. Alfredo advises him to steer clear of love because it only causes pain. Despite his warning, Salvatore confesses his love to Elena, who's reply is that she does not, but she could. So he waits, every night outside her house for her reply. One day he gives up and trudges home depressed and upset only to soon discover that Elena does love him in return. They begin a passionate romance, like that of two newlyweds. Unfortunately, Elena's father doesn't approve and so he takes Elena away. All summer they try to meet, sometimes successfully, sometimes not. On one particular day he tries to reach her and she him but their paths don't cross. As we discover later, Alfredo catches Elena and convinces her to leave Salvatore alone out of love. Salvatore then wanders without purpose and eventually joins the military due to the requirement by Italian law that all male youths serve for a period of time in the army. When he returns to his home town, all has changed and he cannot adjust. Alfredo urges him to leave and tells him that if he were to ever return, he would not see him. Obviously Salvatore goes on to become a successful filmmaker. As he wanders the remains of his town after the funeral he sees a vision of Elena just as she was when they were young; he realizes it is Elena's daughter and follows her to Elena's home where he sees that she married one of Salvatore's childhood friends, a dunce when Salvatore knew him. He confronts Elena and they meet. They talk and she reveals to him that she didn't miss out on their fateful reunion but rather that Alfredo convinced her to leave. Salvatore realizes what a role Alfredo had in shaping his life and that Alfredo knew that if he stayed with Elena he would have no chance to pursue his love of film and so by going to Rome to become a filmmaker he sacrificed his love for Elena. Salvatore and Elena say farewell and go their separate ways. Salvatore returns to Rome with a can of film left to him by Alfredo. It contains all the splices of the kissing scenes from Salvatore's youth.